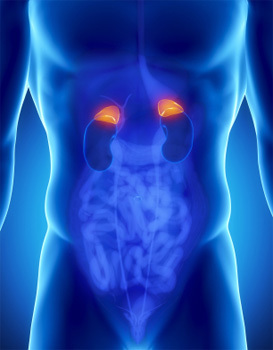 The adrenal glands are located on top of each kidney and are known as stress glands of the body. In addition to managing stress throughout our bodies, the adrenal glands are very important for many other functions as well. Even though the adrenal glands can take quite a bit of stress, it is possible for them to be over stimulated. Adrenal insufficiency is an endocrine or hormonal disorder that develops when the adrenal glands are not able to produce enough hormones of a specific kind. There can be two types of adrenal insufficiency: primary and secondary. Primary adrenal insufficiency (commonly known as Addison’s disease) develops when the adrenal glands are not working properly and are unable to produce enough of the hormone cortisol and often the hormone aldosterone. Secondary adrenal insufficiency develops when the pituitary gland (located in the brain) is not able to produce enough adrenocorticotropin (ACTH) which stimulates the adrenal glands to make cortisol. Fatigue and chronic fatigue is one of the most common complaints patients experience. Chronic fatigue syndrome is a difficult condition characterized by extreme fatigue that can’t be interpreted by any underlying medical condition. The fatigue can get worse when engaging in physical or mental activity, but doesn’t get better with rest. The cause of chronic fatigue syndrome is unknown, although researchers believe that it can stem from various conditions — ranging from viral infections, hormonal imbalances, to psychological stress and immune system complications. Adrenal fatigue is different from Addison’s disease. Addison’s disease is a rare condition where the adrenal glands completely fail–whereas adrenal fatigue is a milder syndrome where the adrenals get overworked and can’t keep up with the demands we place on ourselves. Adrenal fatigue is a very common condition that occurs when the adrenal glands function below the necessary level. Most commonly associated with intense or long periods of stress, it can also occur during or after acute or chronic infections, mainly respiratory infections such as influenza, bronchitis or pneumonia. Anyone can suffer from adrenal fatigue at any time in their life. However, there are factors that can make you more susceptible to adrenal fatigue. These include lifestyles habits (poor diet, substance abuse, too little sleep and rest, or too much stress), chronic illness or repeated infections, long periods of situations that you feel trapped or helpless in (poor relationships, stressful jobs, poverty), or maternal adrenal fatigue during gestation. Addison’s disease is an autoimmune disorder which includes the slow destruction of the adrenal cortex (outer layer of the adrenal glands) by the body’s immune system. Addison’s disease makes the body’s immune system think that its adrenal cortex is a foreign substance, and starts attacking it as well as other tissues and organs. Tuberculosis (TB) has also been linked to the development of adrenal insufficiency as well. Secondary adrenal insufficiency is due to a lack of ACTH. Without ACTH, the adrenal glands cannot be stimulated and will not be able to produce the hormone cortisol. Symptoms and signs are similar to those of Addison disease. Exercise and Nutrition- The best way to manage cortisol is exercise and nutrition. Exercise releases endorphins that will reduce stress levels in your body. Eating healthy will help fuel your body after exercising as well. Get enough sleep- Fatigue is a very common symptom for people who suffer from adrenal disorders. Sleep is important because it helps your body and brain repair from the stresses you encountered throughout the day. 7 to 9 hours of interrupted sleep every night is recommended for adults. When our adrenal glands are not able to produce enough cortisol, it can increase our risk of developing osteoporosis, impaired immunity, reduced muscle mass, and increased abdominal fat. It is important to speak to your doctor if you suspect to have adrenal insufficiency. Adrenal stress index testing is a non-invasive way to help evaluate the effects of stress on your body. It includes 10 tests for 6 different hormones (through analyzing 4 saliva samples) and immune markers that may be affected by chronic stress or other conditions. Call our office today if you have any questions about Adrenal Disorders and Stress.